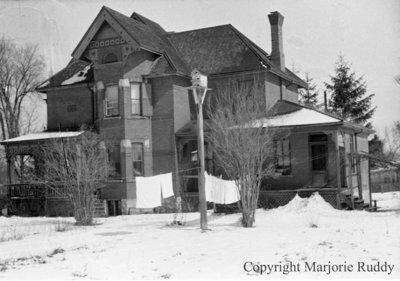 A black and white negative of the side of an unidentified house in winter. In this view laundry is visible hanging on a line. We do not know the location of the house. The negative was found in a cigar box with no documentation. Unidentified House, c.1945, Marjorie Ruddy. Whitby Archives A2013_040_836A. Scanned from a black and white negative.